Is it the grayness of the September squalls blowing through Lambert Channel between Hornby and Denman Islands that suffuses this tiny harbor town with its eerie chill today? I am trying to imagine this teacup port bathed in northwest sunshine, envisioning it with a quirky artist’s flair and peculiar northwestern island charm, but I can’t shake the feeling of foggish, odd distance that I’ve felt since we sailed in this evening. The inner docks of the marina are stacked deep with odd, old boats, many of which look like they haven’t moved in years. They are a motley mix of decrepit and unusual sailboats and ancient, yet possibly still working fishing boats. There are the aging ferro-cement sailboats painted peeling pastel, odd-shaped and curiously homey, their decks littered with rusty bicycles and crab pots, their waterlines alive with waving white anemones and large red crabs, boats that have probably known risky adventures and unusual people, boats with stories. There are the fishing vessels which are even older, though mostly these have cleaner waterlines, possibly sea-worthy, and mixed among the ancient tackle is fishing gear that looks functional. I imagine timeless men in slick coveralls and knee-high boots slipping their moorings in the pre-dawn to practice their ancient art, though some of these boats, too, are buried too deep behind others to make their way to the sea. There is the old wooden schooner, a classic beauty that too has seen many years, its varnish and paint now flaking and faded, which is also several-boats deep. She has the air of an old teacher, and the silent footfall of generations of her students linger suggestively in the murky quiet. 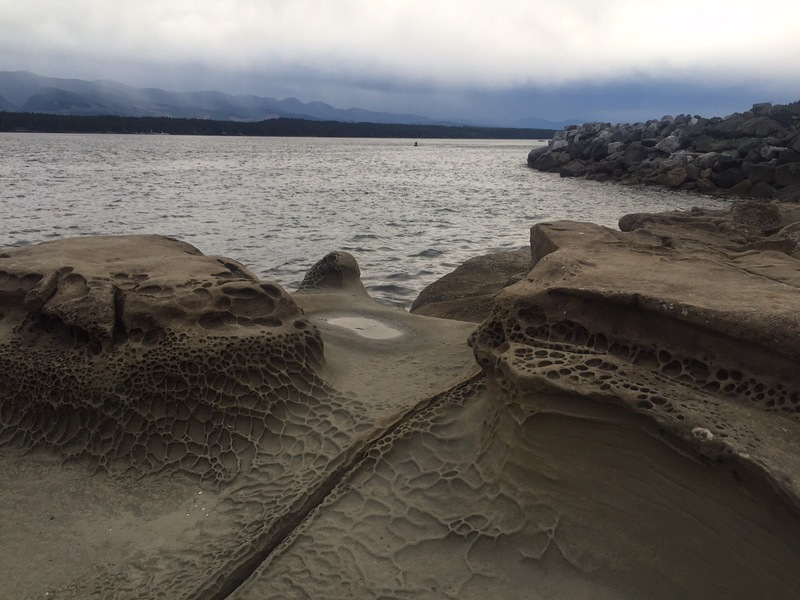 The shore here is sandstone, intricately and amazingly carved by eons of waves and winds. It is alien and incredible. 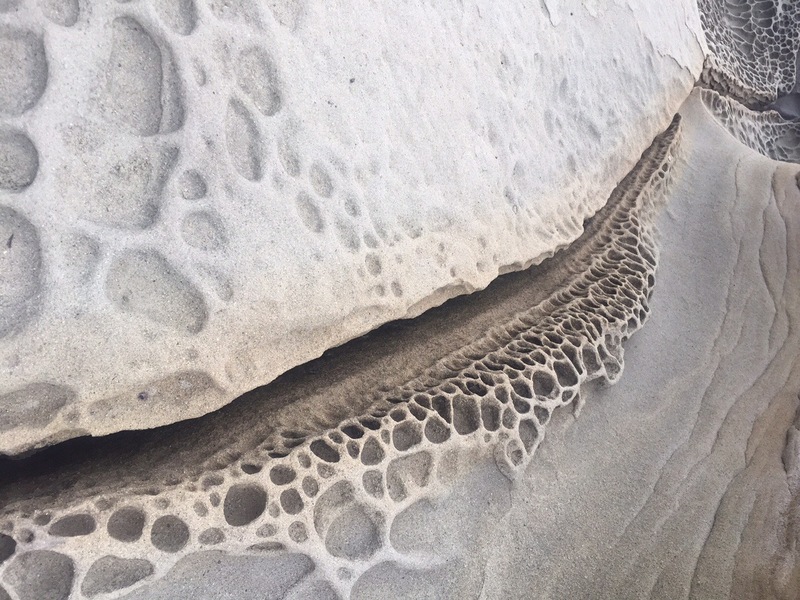 At low tide, the exposed rock is a knobby expanse of rippled furrows and rounded miniature craters. The patterns are organic and swirling, repetitive yet surprising. In places, it looks like the fossils of dinosaurs or aliens have left impressions in the rock. The lowest places are covered in tiny white barnacles and tinier dark snails. It is an utterly remarkable, textured landscape. Ashore, there are a surprising number of people in and around the small, but well-stocked grocery, but it is mostly quiet. A couple of men are reading at window-side tables inside; neither looks up from their book. A mom and child sit perched on wind and water-carved stone outcroppings watching the blackish-green waves. A lone teenager throws rocks into the water from the pock-marked sandstone shore. Everyone seems to be talking in subdued voices. No laughter. No children playing. No music. No casual chatter. Is everyone mirroring the the gray, the heavy, damp feeling in the air that precedes the coming squall? Is this the calm before the storm? Is this the lull that rides on the shoulder of the tourist bustle, once the brief summer flurry passes? I imagine time in this cove might be like a rock skipping across the waves, touching down here and there. I have the sense that multiple lifetimes spanning multiple decades are unfurling simultaneously here; the senior fishermen, the ghostly fishermen, slipping out to see between the shining fiberglass power cruisers and preppy yacht club sailors, the ageless local potters and watercolor painters selling sea-inspired art in the tiny gallery to the seasonal tourists. I imagine that people are also like skipping stones here; briefly alighting in this tiny cove before bouncing on to their next harbor. I wonder if they notice in their brief visit who their neighbors are, whether they are from this time or another. I wonder if they feel the ever-now-ness of this place and moment, which has existed in every past moment and every future moment exactly like this, slowly worn into swirling patterns by the sea. Ford’s Cove, Hornby Island, BC, from aboard the SV Cormorant.